The world of ceramic surfaces addresses the challenges of the market with more and more innovative proposals, the fruit of designers’ creativity and desire for experimentation. The result is a range of surfaces featuring surprising patterns, effects and colours, the product of attentive observation of contemporary visual culture. Choosing the best floor and wall coverings and kitchen and bathroom countertops doesn’t mean focusing solely on aspects such as functionality and everyday practicality. The process is in fact often located in a particular "emotional territory" in which infinite images, sensations and memories are rooted, and in which we draw on our everyday experiences, both direct and filtered through the mass media. It follows that the result of these continuing visual experiences is a new image, original and highly personal, which everyone searches for within themselves in order to reproduce it in their home and the workplace where they spend their time. On the basis of this social and emotional analysis, designers are now oriented toward surfaces that go beyond traditional surface covering materials such as wood, marble, stone, cement to explore unusual materials initially intended for other uses and settings. To these materials we may add the spaces in which the materials were originally used: often exotic locations or places far removed from our daily lives which are highly evocative and often have accentuated decorative qualities. The desire to experiment and come up with something new is at the root of the partnership between Iris Ceramica and the Diesel brand. The "Diesel Living with Iris Ceramica" homestyle partnership was created with the intention of expanding the horizons of high-tech ceramic surface design with a great variety of collections in a refined, dreamy mood. Cosmic Marble, presented at Cersaie 2018, is a collection of high-tech ceramic slabs reinterpreting the traditional sheen of marble and taking it up a notch aesthetically. To understand Cosmic Marble’s roots in the collective imagination, simply consider its source of inspiration: "the colours, shapes and grain suggested by planets’ and moons’ surfaces and atmospheres, to recreate the cosmic wonder experienced by past and future astronauts". Metal Perf is the Diesel Living with Iris Ceramica collection openly inspired by the energy of metals: from steel to aluminium, from copper to bronze. 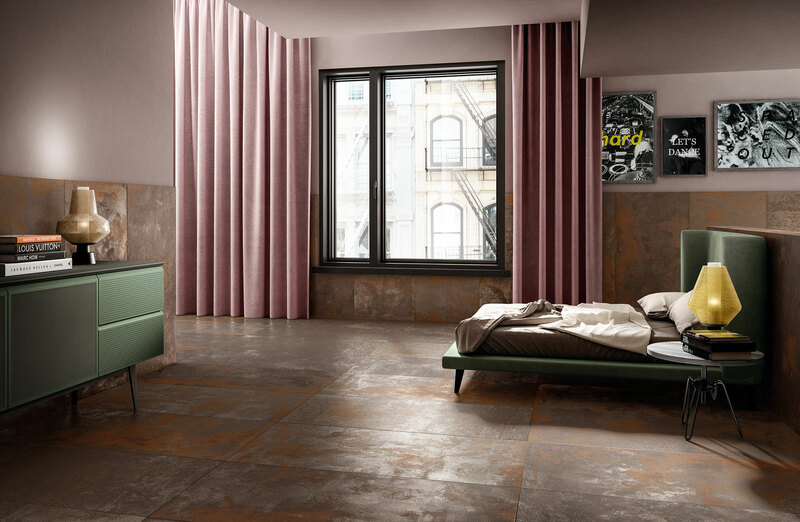 The metallic effect on floors and walls creates an atmosphere of power and strength: the lived-in look of rust permits creation of atmospheres in a contemporary urban style with a post-industrial vintage flavour. A true kaleidoscope of colours, veins and shapes in which nothing is easier than creating a customised interior decorating scheme including reclaimed items and bold, provocative bright colours, in a mood underlined by shadows and fading hues. 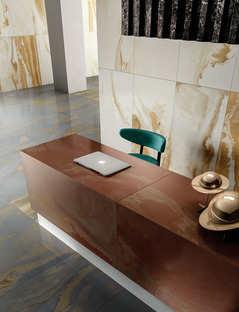 Cosmic Marble and Metal Perf were featured in Vienna at Iris Ceramica’s stand at the recent H.O.M.E D.E.P.O.T. 2019, an important furniture and interior design show. Organised by H.O.M.E magazine in the historic Semper Depot Museum (now with the Vienna Academy of Fine Arts), the event saw the renewal of the Diesel Living with Iris Ceramica partnership in pursuit of quality and innovation. To satisfy increasingly demanding requests and offer refined solutions, the stand in Vienna "underlined the uniqueness of the collections and the painstaking focus on detail and constant research into materials". With a view to achieving maximum customisation of contemporary spaces, the Iris Ceramica stand used DYS - Design Your Slabs technology, the on-demand customisation method employed by the Iris Ceramica Group. The DYS system allows any kind of design or effect to be reproduced on Iris Ceramica ceramic slabs, greatly expanding their potential applications. From optical effects to the bright colours of illustrations and graphics of any kind, from photographs to reproduction of artistic images, DYS technology can be used to transform surfaces at will, giving free rein to the imagination.